All sorts of wood floors have character. One of the best wood floors, however, is in a former manufacturing facility in San Antonio. The old-growth longleaf pine planks are probably six inches wide and have been laid at an angle across the expansive space. The building once housed an army of seamstresses and it shows. Throughout the space it can be told where sewing machines were bolted to the floor. In fact, in some instances, it is possible to see all the way through the wood to the floor below. Thankfully, there are no plans to tear down this building with the fabulous floors. But across the country, old buildings, as well as barns, warehouses, even gymnasiums, are being demolished. The good news is that much of the wood in these structures is being reclaimed and used in new construction. One recently completed floor incorporated reclaimed dark wood from the exposed siding of a Texas barn. The species for this wood is longleaf pine, which used to be found up and down the Texas Gulf Coast. From Texas to Europe, reclaimed wood is being used. In a private home in Houston the owner supplied reclaimed pine paneling from England for use in her residence. She purchased the pine from an architectural antique shop in Houston and used it to create an elegant blonde pine floor in her formal living room. Reclaimed wood flooring adds warmth to a new structure, gives it character and helps create an “instant history” in a new space. A homeowner may be able, for example, to tell guests about the seamstresses, whose machines were bolted to his home’s floors, sewing uniforms for soldiers during World War II. It turns out that patina is a great conversation starter. With growing environmental consciousness, reclaimed wood flooring is growing in popularity. No new trees have to be harvested and many folks like the idea of salvaging materials that might otherwise end up in a land fill. In fact, so many people are clamoring for reclaimed wood that the costs have risen dramatically in recent years. Reclaiming flooring is not as simple as prying boards up from one location and transporting them to another. Reclaimed wood must be stripped of old nails and metal fragments, chemically tested and kiln-dried just as new-growth wood. This process greatly reduces the chances of introducing insects or toxins into a home or other new building. There are no regulations governing the reclaimed flooring industry so consumers must shop carefully to ensure they get what they pay for. The best way to avoid disappointment is to buy wood from a reputable, established company that has its own standards for milling, drying and grading wood. 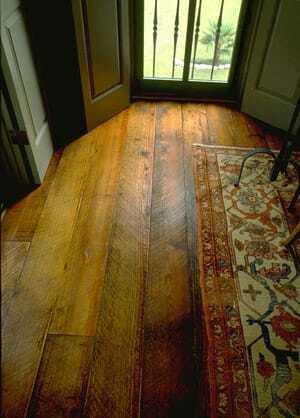 For those who want floors with the beautiful patina of aged wood, reclaimed flooring is a great option. But before demolishing the barn that’s been in a family for generations, a builder might consider new wood made to look old. Expert craftsmen know tricks like hand-beveling and scraping that can help give new floors the mellow appearance of reclaimed ones. Whether floors are new made to look old or they’ve actually been under underfoot since the turn of the century or so, with the proper care and maintenance, they should provide homeowners with many years of enjoyment. Grit, gravel and dirt are the biggest enemies of floor finish. The best way to prolong the life of the finish of a floor is to keep the grit off the floor. Vacuum regularly with a canister type vacuum cleaner. Another option is to use an untreated dust mop with polyurethane finishes. Slightly damp sponge mopping is acceptable. Wipe up any residual moisture with an old towel. Excessive amounts of water can cause the floor to cup.